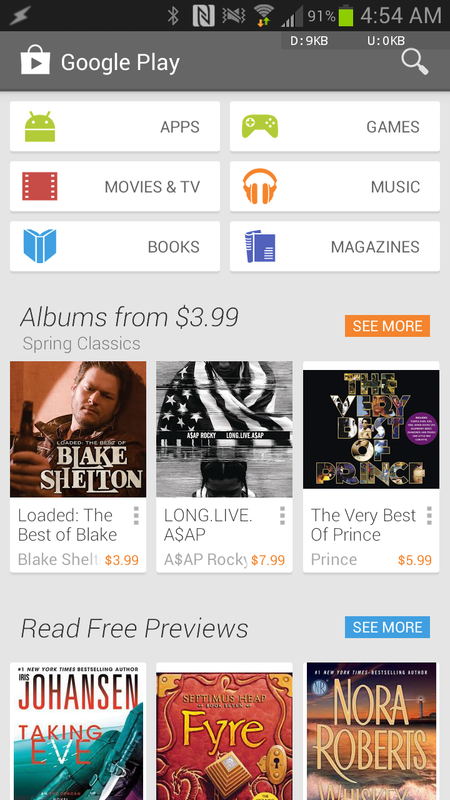 A minor update to the new, cleaner Google Play Store v4.0 started rolling out earlier today. The new version is 4.0.27 which follows closely the previous version from April 19th - 4.0.26. Ron and I tore down the apk but found only minor changes to translations and a small change to the manifest that removed android:excludeFromRecents="true" from one of the billing activities. There could be something we missed, but it does look really-really minor. If you're bugged by something like "marcados como NUEVO" vs "marcados como NUEVOS" and similar fixes, then by all means, download away. 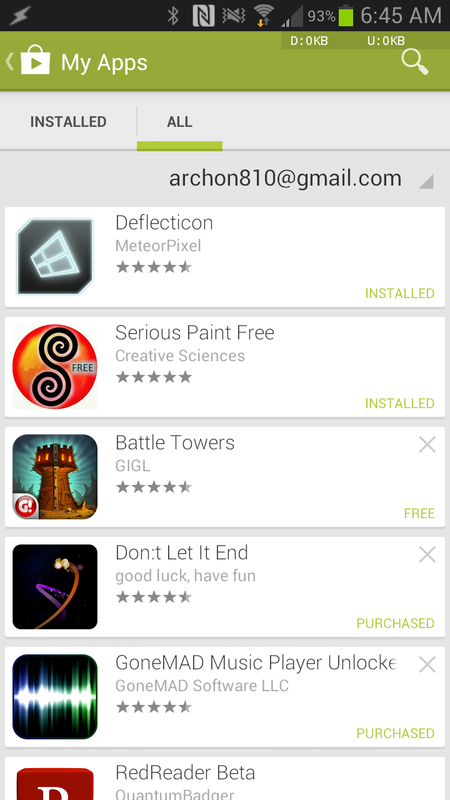 Your Play Store should update soon anyway, whether you want it or not. Oh, and this is not fixed. Argh. But hey - it's on the list. Yay! As was the case a week ago, we are seeing more and more reports of the Play Store's featured/promotional and recommended content coming back to life for those of you outside the U.S. 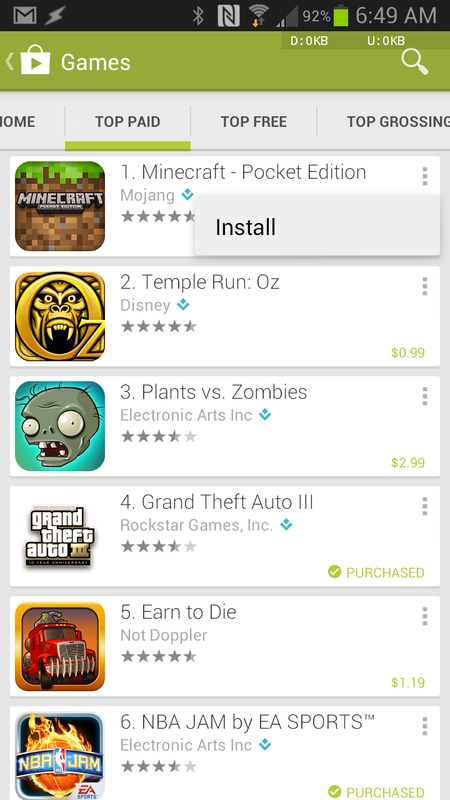 When the Play Store refresh just came out, only people in the U.S. could see such content. It has since started showing up in many other countries, so if you've been holding off upgrading until further notice, consider yourself notified. Even though v4.0.27 doesn't contain big improvements, we always try to make the latest version of the Play Store available to anyone looking for it. You will find 3 mirrors towards the bottom of this page as well as a multi-mirror should the first three links fail. As a refresher, here are the main highlights of the big 4.0 redesign. 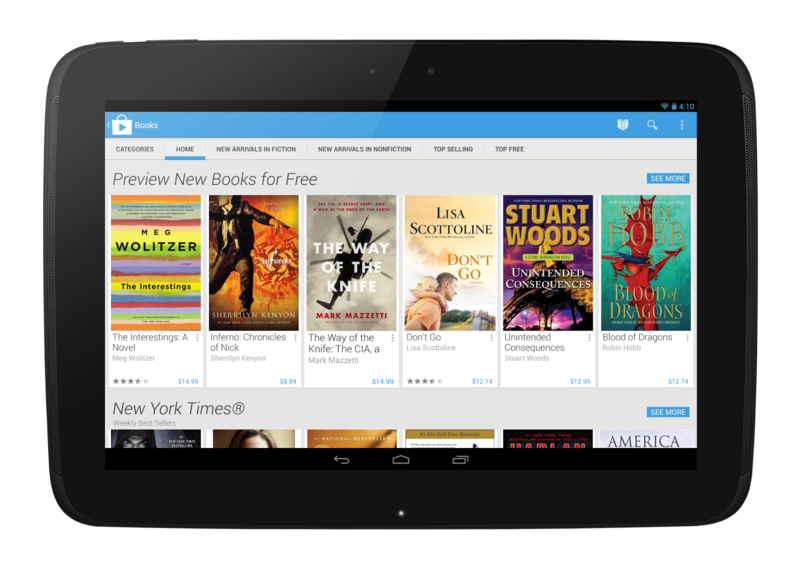 The new Play Store looks a lot better, especially on tablets. It groups similar content together, continues showing recommendations as you keep scrolling, and simplifies the purchasing process. Each app in lists now has a handy Install button - just click the menu icon at the top right corner of any card, then press Install. Furthermore, in-app purchases can now be performed without leaving the context of the app you're in. And finally, the annoying post-install screen that appeared a short while ago is also gone. I've heard reports that v4 started rolling out in UK already. Try it out - you should see the featured/related stuff fine. I got OTA update to v4 yesterday... and I'm not too happy about it - it LOOKS AWFUL (yuck!) and it's laggy (i9250). less laggy than v3 and it looks like the rest of googles stuff. I disagree. The color yes, but I like the layout tons better. The card ui gives it a Google look. The person at google whom is responsible for picking the green should be shot at dawn sans ciggie or blindfold....disgusting!!!!!! Whom is used if the subject is Not performing the action. "To whom should I (I'm performing the action) be speaking?" If the subject Is performing the action, it's who. I have the new version already. Although no promotional content yet. 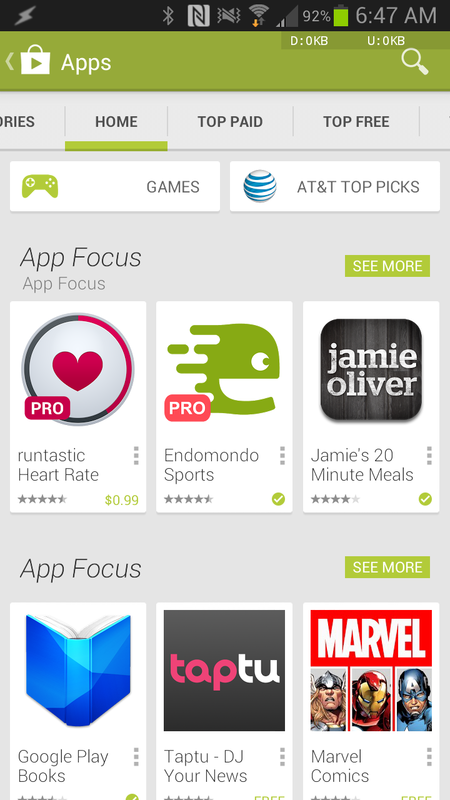 I updated Play Store to v4 from the apk announced here, and I see featured/related apps in Hungary. Yes we have still like.. 3.5? Would it still work if I've installed it manually? I'll stick with 4.0.25 a little longer, I suppose... doing the dpi hack to 132dpi for my Touchpad is 3 minutes of my life I can waste better on other useless tasks, like staring off into space. well you could have done it in the time it took you to read this article and write a comment... haha, i'm to lazy to install it myself so I can't talk. Great news, great news. Thanks AP again for all the relevant news first. I have never side loaded any app till now. I did it with some app installer. you dont need to. 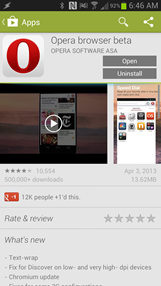 download it on your phone (meaning go to this page on your phone) and install it. Hello I uninstalled it accidentally then installed it from here and now its crashing and won't open help? u r wp fan right ? what ru doing with android ? Can anyone confirm this working in India? Spain is looking good now (finally)! It's there an official way to force the update? Still haven't gotten the first update on my N10. My Nexus got it a week ago. The Open/Update and Install/Buy/Uninstall buttons are so small in v4. Seems like an odd change for touch devices. There's unused space to the left of them too. I was sort of hoping it was a mistake. In reality though, the buttons aren't really that small compared to the old interface (at least to me). The probably made the buttons smaller to tighten up the interface a bit. I'm no designer, but now there's wasted space; I'm not sure that counts as 'tightening up'. Why they made icons so big. I don't like it -- mainly because before, everything was 2 columns. Now, it's all single column, except for Trending which is triple column. That means there is a tonload of empty space I need to scroll through. If everything could be made like the triple column Trending, I'd like this a lot more. Store gradually becomes unusable. 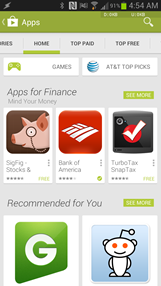 Last year disappeared the ability to display a list of purchased applications. And now, instead of displaying twelve search results per screen (Play 3.10) shows only two to four big icons. I have a Samsung Galaxy S (i9000). I need help, AP. 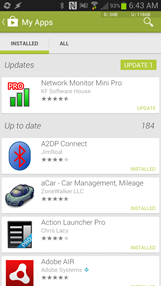 Updated to latest version: FC when I download/update anything. Uninstalled from root and reinstalled, same. Removed Google account and signed in again, same. Reverted to older version, same. Other than nandroid I'm stuck and don't have a recent one... any suggestions? My note II is still on v3. They haven't started rolling out v4 to India have they? I don't even have the first update yet. 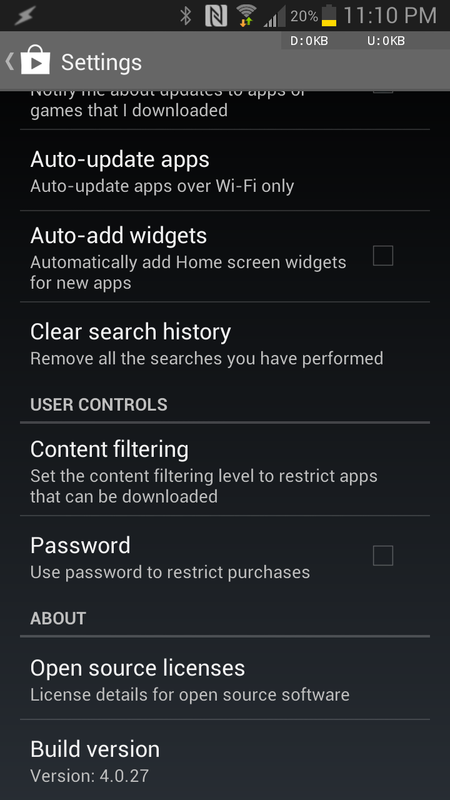 samsung seems to block google playstore from working in the newest version. 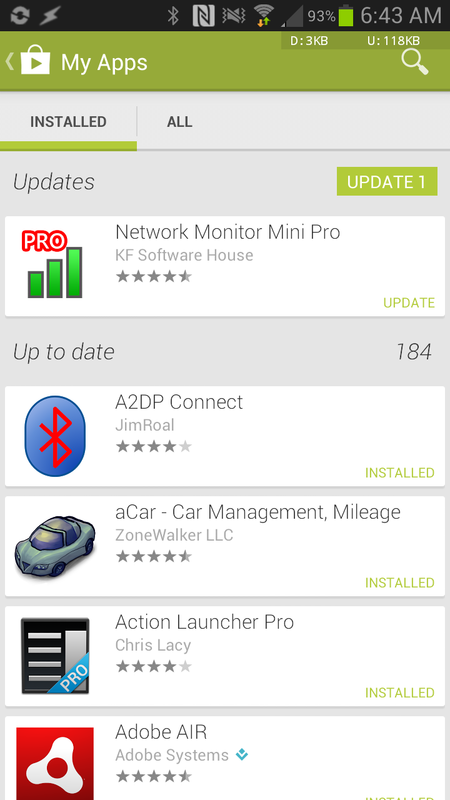 apps from mircrosoft and many places are missing at the samsung store. when google playstore is clicked, the application opens for about 2 seconds then it closes. if anyone has a solution, I would appreciate if you post a workaround solution. anyone know of other stores. because the samsung store really not worth using. Hi. Please help me. How can I download Google store on my Colby kyros mid7038?please please help me..
5" S4 screen and icon sized for retarded people.. 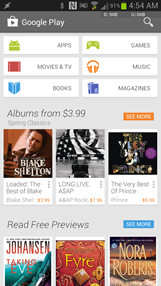 The new Google play S*£@. The designers should get new glasses. Idiots! How do you download the version? 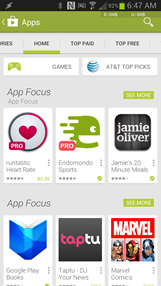 I generally like the new look of the Google Play Store, although I think they could have chosen a better choice of colors. How about making the colors a tad darker, like they are in the Google logo? Otherwise, I think the layout was a great improvement. I absolutely hate the new look. Why does my tablet look like it is set up for the visually impaired? It is outrageous for 7 inches of awesome to display only 6 icons (such a shame). I also enjoyed the darker look and the white and green is overwhelming. I hope they decide against this in the long run. I usually respect droids a lot but this seems to be a step back. I understand keeping things simple, but this is keeping things boring, unattractive, and illogical. where is the DOWNLOAD BUTTON!?!?! 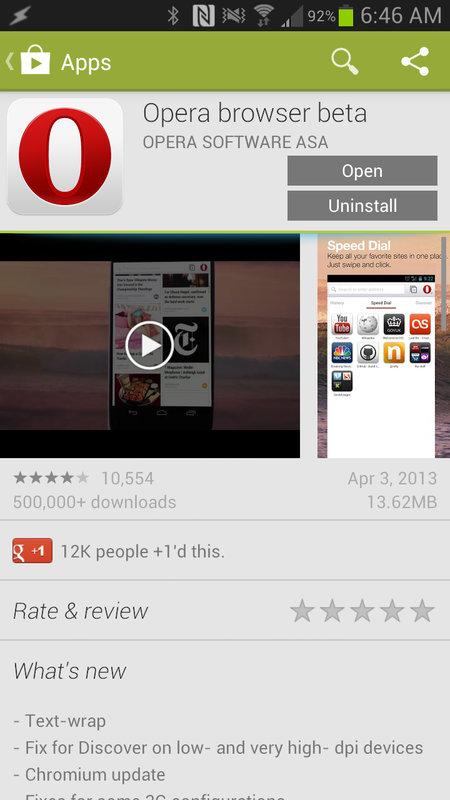 I can't download the app from here.then too the google play store app is very good and it contains many of the apps. 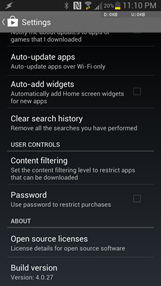 I had Google Market and didn't get an auto update of Google Play Store on my device. So was searching a lot and ended up in this post. I just downloaded the com.android.vending-4.0.27.apk file and transferred to my HTC Desire running on Android 2.3.3. 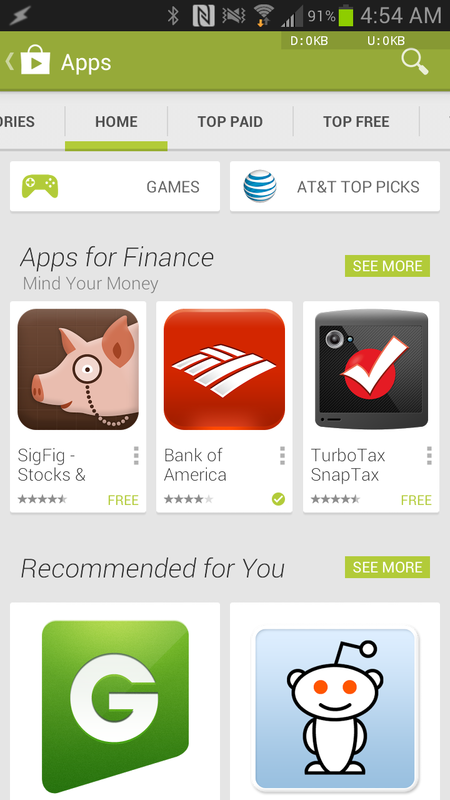 Just installed the apk and Google Market got updated to Google Play. 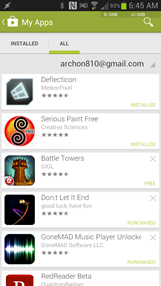 A very big thanks to Artem Russakovskii for uploading the Google Play Store apk file here.